An important open problem in human behaviour is the understanding of how coordination emerges in human ensembles. Researchers have seldom studied this problem quantitatively in existing literature, in contrast to situations involving dual interaction, where two individuals coordinate each other’s motion. Examples of coordination in human groups include sport (e.g., team rowing, ice skating, dancing), walking crowds, clapping audiences, musical ensembles, and collective performance. Addressing these challenges is fundamental in a number of applications, including, the development of virtual agents for rehabilitation of social disorders [3, 4], or the use of social robotics to program artificial agents to best interact in a group of humans. 1. In our study, recently accepted for publication in Scientific Reports – Nature, we analyzed motor coordination (or synchronization) in a group of individuals. We used a paradigmatic case of study, in which participants were asked to visually coordinate an oscillatory hand motion. We separately tested two groups of seven participants each, as well as different patterns of visual coupling (i.e., who looks at whom). By means of statistical data analysis methods, we show for the first time—experimentally and computationally—that different visual interaction patterns in the group affect the coordination level achieved by its members, as measured by the group synchronisation index, say ρgρg, taking values in the range [0,1][0,1] (00 corresponding to absence of coordination and 11 to perfect synchronization between the participants). In addition, we unfold the effects on group synchronization of heterogeneities in the individual motion characteristics of the participants (measured in terms of the intrinsic frequency of oscillation they generate in isolation). Specifically, we show that the level of coordination achieved by the group members is influenced by the combined action of the features characterising their motion in isolation (i.e., their natural oscillation frequency) and the specific interconnections (i.e., topological structure) among the players. Furthermore, we find that some topologies (e.g., all-to-all) give rise to higher levels of synchronisation regardless of individual differences, whereas for other topologies (e.g., consecutive dyads), a better synchronization is achieved through a higher homogeneity in the individual dynamics. Similar results on the effects of the structure of visual couplings among the players on their coordination level have also been obtained in the absence of social interaction via a novel computer-based set-up, as recently suggested in . 2. Another important open question is to understand whether one or more individuals in the group take on the role of leader, steering the others’ behavior towards synchronization. To investigate this, we developed a methodology to reconstruct (from movement data) a directed weighted network representing the leader-follower interaction between group members . Our preliminary results suggest that the emergence of leadership is a very sophisticated process. We are currently investigating that process in depth. 3. 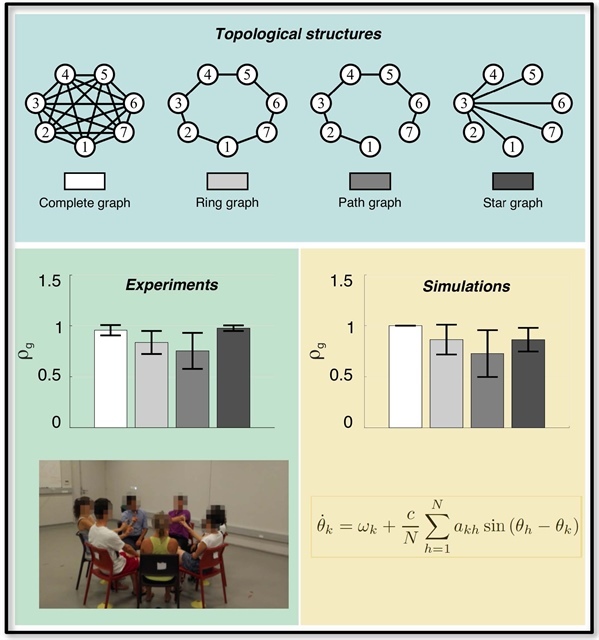 Finally, we found that when performing our coordination experiments, the group behaves as a network of nonlinearly coupled heterogeneous oscillators, despite the complexity of unavoidable social interactions. The model also reproduces the coordination level’s dependence of each individual in the group upon the intrinsic properties of its members and the interaction structure among them, notwithstanding the complex neural mechanisms behind the emergence of such coordination. Our findings on human group synchronization are relevant to any activity requiring the coordination of several people—like music, sport or workplace situations—and can be extended to account for other perceptual forms of interaction, such as sound or feel. Moreover, the availability of a mathematical description of the players’ dynamics can be instrumental in designing better architectures driving virtual agents (e.g., robots, computer avatars) to coordinate their motion within groups of humans, as well as for predicting the coupling strength needed to restore synchronisation based on initial knowledge of individual consistency, group variance, and topology. Read the original article on SIAM News here. Alderisio, F., Fiore, G., & di Bernardo, M. (2017). Reconstructing the structure of directed and weighted networks of nonlinear oscillators. Physical Review E, 95(4), 042302. Alderisio, F., Lombardi, M., Fiore, G., & di Bernardo, M. (2017), A Novel Computer-Based Set-Up to Study Movement Coordination in Human Ensembles. Frontiers in Psychology, 8(967). [Słowiński, P., Alderisio, F., Zhai, C., Shen, Y., Tino, P., Bortolon, C.,…,Tsaneva-Atanasova, K. (2017), Unravelling socio-motor biomarkers in schizophrenia. npj Schizophrenia, 3(8). [Słowiński, P., Zhai, C., Alderisio, F., Salesse, R., Gueugnon, M., Marin, L.,…,Tsaneva-Atanasova, K. (2016), Dynamic similarity promotes interpersonal coordination in joint action. Journal of The Royal Society Interface, 13(116), 20151093.